Diamond jubilarian Sister Jean Baptiste entered the Sisters of St. Joseph from Holy Rosary Parish in Erie. She currently ministers in the development and communications offices of her congregation. She taught at Blessed Sacrament School, Erie; St. Agatha High School, Meadville; and St. Leo High School, Ridgway. For 25 years, she also taught at Erie’s Cathedral Preparatory School, where she was inducted into its Hall of Fame in 1994. She served in administration at the former Villa Maria College, Erie, and served her religious community in various capacities, including as executive secretary-treasurer, treasurer, council member, formation team member and member of the board of directors. For 30 years, Sister Jean Baptiste was an auditor in the Diocese of Erie’s Tribunal Office, and also served on many community and church-related boards. She volunteered for Harborcreek Youth Services, Cathedral Prep and the Spanish Apostolate. In 1996, she was awarded the Papal Cross Pro Ecclesia et Pontifice by Pope John Paul II. Her call to religious life, she says, was nurtured by the simple faith of her immigrant parents and years of example and encouragement of the Sisters of St. Joseph. Hearty congratulations from your home parish, Holy Rosary! 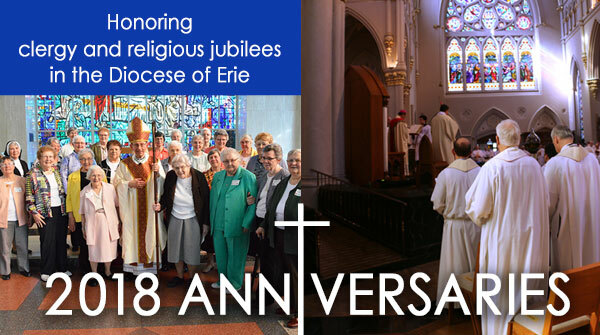 Saint Mary's Home of Erie would like to congratulate you on your jubilee. Thank you for your dedication to our mission of "Loving to Care." Happy 75th jubilee to our Sister Jean. We felt special working with you as a fellow "cellar-dweller." The members of the Gannon University Family congratulate and wish God's continued blessings on Sister Jean Baptise DiLuzio, SSJ, '52VMC, for her exceptional dedication to service and the mission of Catholic education in the Diocese of Erie. A native of St. Peter Cathedral in Erie, Sister Mary Julia taught for 25 years at several diocesan elementary schools, including: St. Patrick, Holy Rosary, Sacred Heart, St. Andrew and St. Ann schools, all in Erie; St. Mary in Reynoldsville; Holy Rosary in Johnsonburg; and St. Leo in Ridgway. She ministered at Saint Mary's Home of Erie and worked in the media library at the former Villa Maria College. She was a teacher and housemother at Harborcreek Home for Boys, and housemother at St. Joseph’s Home for Children. She graduated from Villa Maria College with a degree in elementary education. Sister Mary Julia believes that with God’s grace, she will continue to live the mission of the Sisters of St. Joseph, which is unity of neighbor with neighbor and neighbor with God. Thank you, Sister, for your wonderful service to Holy Rosary, Erie! The members of the Gannon University family congratulate and wish God's continued blessings on Sister Mary Julia Scully, '58VMC, for her exceptional dedication to service and the mission of Catholic education in the Diocese of Erie. The members of the Gannon University family congratulate and wish God's continued blessings on Sister Kathleen Kirsch, SSJ, '49VMC, for her exceptional dedication to service and the mission of Catholic education in the Diocese of Erie. Benedictine Father Daniel Wolfel, a monk of Saint Vincent Archabbey in Latrobe, is a native of St. Marys. During his 70 years of religious life, he served parishes in the dioceses of Greensburg, Pittsburgh, Altoona-Johnstown and Erie, all in Pennsylvania; and Youngstown, Ohio. From 1998 to 2002, he was pastor of Sacred Heart Parish, St. Marys, and from 2003 until his retirement in 2016, he served as senior priest at Queen of the World and St. Mary parishes, both in St. Marys. He received a bachelor’s degree in philosophy from Saint Vincent College in 1950, and a master’s of divinity from Saint Vincent Seminary. At one time, he was socius of novices at Saint Vincent, assistant curator at Saint Vincent Museum and a religious instructor at Saint Vincent Preparatory School, from 1953-54. At one time, he served as assistant treasurer of Saint Vincent Archabbey. Father Daniel has been spending his retirement years at Saint Vincent Archabbey. Congratulations and God's blessings, Father Daniel — From Queen of the World! Father Daniel C. Wolfel, OSB, congratulations on your 25th jubilee. The Diocese of Erie has been richly blessed by the Benedictine charisms and generous pastoral care you have shared with the faithful. God bless you! The members of the Gannon University family congratulate and wish God's continued blessings on Father Daniel C. Wolfel, OSB, for his exceptional dedication to service and the mission of Catholic education in the Diocese of Erie. Sister Ann Marie entered the Sisters of St. Joseph from Sacred Heart Parish in Erie. She currently ministers as mission effectiveness coordinator for her congregation and is co-director of the Sisters of St. Joseph Associate Program. She taught at many schools, including Blessed Sacrament, Our Lady of Peace, St. John the Baptist, St. Andrew, Holy Rosary and St. Ann, all in Erie, as well as St. Leo in Ridgway, and St. Bernard in Bradford. She also taught at Villa Maria College and Gannon University. She earned a bachelor’s degree in elementary education from Villa Maria College and a master’s degree in education/reading from Edinboro University of Pennsylvania, where she also was certified as a reading specialist and studied library science. The community’s consensus statement, she says, has become an inspiration and source of frequent reflection, a constant reminder of the day-to-day striving for “more” — the love of God and love of neighbor without distinction. Thank you, Sister, for your faithful service to our partnered parishes of Holy Rosary and St. John's, Erie! The members of the Gannon University family congratulate and wish God’s continued blessings on Sister Ann Marie Cappello, SSJ, '66VMC, for her exceptional dedication to service and the mission of Catholic education in the Diocese of Erie. Celebrating 60 years with her Benedictine community, Sister Mary Therese is a prime example of sisters working well beyond the traditional age of retirement. Today, she remains in the position of director of Information Technology at Mount St. Benedict Monastery in Erie. Her technical expertise with computers was first nurtured in 1995, during assignments as a computer technician and interactive TV coordinator for the Diocese of Dodge City, Kan. A native of Oil City, her primary ministry was in education. She spent 35 years as an elementary school teacher and administrator in Sharon, Clarion, Oil City and Erie, as well as at schools in both Wickliffe, Ohio, and Vienna, Va. Sister Mary Therese says St. Paul’s letter to the Corinthians — with its passage on patience, kindness, strength, endurance and constancy of love — has inspired her throughout her life as a Benedictine. Thank you for your years of service to our diocese and especially for the years you blessed us here at St. Joseph Parish in Sharon. The members of the Gannon University family congratulate and wish God's continued blessings on Sister Mary Therese Egan, OSB, for her exceptional dedication to service and the mission of Catholic education in the Diocese of Erie. The members of the Gannon University family congratulate and wish God's continued blessings on Sister Joseph Marie Fitzgerald, SSJ, '66 VMC, for her exceptional dedication to service and the mission of Catholic education in the Diocese of Erie. Hearty congratulations, Sister Mary! Not only did you grow up at St. John's, but you taught here and were principal of our school, and led beautifully our neighbor, Saint Mary's Home, for years! The members of the Gannon University family congratulate and wish God's continued blessings on Sister Mary Fromknecht, SSJ, '67VMC, for her exceptional dedication to service and the mission of Catholic education in the Diocese of Erie. Congratulations and thank you for your many years of dedicated service to St. Gregory Parish. The members of the Gannon University family congratulate and wish God's continued blessings on Sister Justina Gutowski, OSB, for her exceptional dedication to service and the mission of Catholic education in the Diocese of Erie. Sister Frances Therese entered the Sisters of St. Joseph from Christ the King Parish in Houtzdale. Since 1997, she has served as the director of religious education for St. Callistus Parish in Kane. Previous ministries included teaching at St. Patrick, Holy Rosary and St. Michael schools, all in Erie; Holy Rosary School, Johnsonburg; and St. Francis School in Clearfield. She also ministered at St. Joseph Orphanage, Erie, and Erie Day Nursery. From 1986-97, she was director of religious education at St. Leo Parish, Ridgway. She says she is inspired and strengthened by receiving the Eucharist at daily liturgy, and believes her vocation came from the example of her parents, who were strong, practicing Catholics. “The words from the hymn ‘What Wondrous Love’ remind me of my wonderful years at home with my family that formed me in choosing my vocation,” she says. Congratulations on your years of service to our parish, Holy Rosary Parish, Johnsonburg. The members of the Gannon University family congratulate and wish God's continued blessings on Sister Frances Therese Matia, SSJ, '70VMC, for her exceptional dedication to service and the mission of Catholic education in the Diocese of Erie. Thank you, Sister Frances Therese, for your many years of dedicated service at St. Callistus Parish in Kane. We rejoice with you on your 60th anniversary! With much gratitude to the Owner of the vineyard who invited you to participate in harvesting its fruits. Thank you for accepting the invitation. Blessings. — St. Basil the Great and Holy Trinity. Sister Elizabeth Ann entered the Sisters of St. Joseph from Blessed Sacrament Parish in Erie. In her most recent ministry, from 2001-14, she served as an accounting associate at the Erie-based Barber National Institute. Earlier ministries included teaching at several diocesan elementary schools, including St. Bernard, Bradford, where she also was principal. Her education ministry also included work as an instructor and assistant professor at the former Villa Maria College, and as an assistant professor at Mercyhurst University, both in Erie. Proficient in business, she worked as a staff accountant at firms in the Erie area. She was supervisor of accounts receivable at Spencer Hospital in Meadville, and vice president of fiscal services at Saint Mary’s Home of Erie, where she also worked in accounts payable. She is an accomplished watercolor artist. One influence on her vocation, she says, was being active in Sodality, which gave young women a chance to be connected with the parish community. Mercyhurst University congratulates those celebrating jubliee years in 2018! Special thanks to Sister Elizabeth Ann Niebauer for your contributions to the Mercyhurst community! The members of the Gannon University family congratulate and wish God's continued blessings on Sister Elizabeth Ann Niebauer, SSJ, '68VMC, for her exceptional dedication to service and the mission of Catholic education in the Diocese of Erie. Celebrating 60 years of religious life, Sister Rosemary continues to bolster the faith by offering spiritual direction and retreats. Her current ministries also include formation and ministry to refugees, as well as serving on the boards of directors of Erie DAWN and Inter-church Ministries of Erie County. A native of St. Joseph Parish in Oil City, she taught for many years in Catholic elementary and high schools in the Diocese of Erie. She served as pastoral assistant at Immaculate Conception Parish in Erie, and in pastoral ministry at St. Patrick Parish and Our Lady of Mercy, where she also served as director of religious education. Active in her religious community, she previously was director of the SSJ Associate Program, director of the SSJ Spirituality Centre, and a member of the SSJ Leadership Council and SSJ Congregational Leadership Team. When she is most aware of God’s presence, she feels a unity and connection with all life and seeks to share that experience with others. Congratulations, Sister Rosemary. Thank you for 18 years with Our Lady of Mercy Parish, to help us grow in love and service. May God bless your continued ministry with the people of God. The members of the Gannon University family congratulate and wish God's continued blessings on Sister Rosemary O'Brien, SSJ, '68VMC, for her exceptional dedication to service and the mission of Catholic education in the Diocese of Erie. Sister Margaret entered the Sisters of St. Joseph from St. Francis Parish in Clearfield. She currently ministers in campus ministry at Kennedy Catholic High School in Hermitage, where she also served as a teacher from 1967 to 2016. She continues to head the school’s Action Club, a school service organization. A lifelong educator, she also taught at St. Francis in Clearfield, and Blessed Sacrament, Sacred Heart and St. Jude schools, all in Erie. She also served on the board of St. John XXIII Home in Hermitage. Recognized by the diocese for her 50 years in Catholic education, Sister Margaret also was honored as a “Hometown Hero” by WKBN-TV in Youngstown, Ohio. One of her favorite Scripture passages, she says, is Micah 6: “This is what God requires of you, only this, to act justly, to love tenderly and to walk humbly with your God.” She considers this a guide of how to live her life. "Make a joyful noise to the Lord, all the earth! Serve the Lord with gladness!" Sister Margaret Pellerite, SSJ, the Diocese of Erie knows your generosity and ministry has been a beautiful expression of Psalm 100. May God bless you! The members of the Gannon University family congratulate and wish God's continued blessings on Sister Margaret Pellerite, SSJ, '65VMC, for her exceptional dedication to service and the mission of Catholic education in the Diocese of Erie. A true leader, Sister Phyllis ministered for 20 years as an elementary school teacher, followed by another 40 in various administrative roles. After teaching at the grade-school level, she taught and participated on the administrative team of St. Benedict Academy in Erie. Having earned her licensure as a nursing home administrator, she oversaw the St. John XXIII Home in Hermitage until she was elected prioress of the Erie Benedictine community in 1990. After two, four-year terms, Sister Phyllis took on a new challenge as a founding member of Catholic Rural Ministry, which offers the presence of women religious to rural counties in the Diocese of Erie, under the auspices of Catholic Charities. Since 1999, Sister Phyllis and Sister Mary Hofmann, OSB, have brought a caring, welcoming presence to Potter and McKean counties, listening to the needs of the people and striving to respond through formation and outreach efforts. St. Raphael parishioners and residents of McKean and Potter counties are greatly blessed by your kind heart and prayerful spirit. May you continue to be present as Christ's hands and feet in our rural area. The members of the Gannon University family congratulate and wish God's continued blessings on Sister Phyllis Schleicher, OSB, for her exceptional dedication to service and the mission of Catholic education in the Diocese of Erie. Sister Carol Ann lives by the words of St. Paul to the Philippians: “For me, to live is Christ.” She is transport liaison for the Care Center at the Sisters of Mercy Motherhouse in Erie. A native of St. John the Evangelist Parish in Buffalo, she entered the Sisters of Mercy in 1958. She earned a bachelor’s degree from Medaille College and a master’s in biology from S.U.N.Y. at Buffalo. After teaching in diocesan schools in Buffalo, she moved to Erie and taught at St. Luke and St. Jude schools, and Mercyhurst Preparatory School. She also taught for a year at St. Michael Navajo Mission School in Arizona. She developed the Service Learning Program at Mercyhurst University, Erie. From 2000-08, she was on the professional staff at Comfort Care & Resources and at Villa Maria Motherhouse, Erie, as a nurse’s aide and volunteer. Mercyhurst University congratulates those celebrating jubliee years in 2018! Special thanks to Sister Carol Ann Voltz for your contributions to the Mercyhurst community! St. Luke Parish offers thanks and prayers for your service and dedication to the Lord. The members of the Gannon University family congratulate and wish God's continued blessings on Sister Carol Ann Voltz, RSM, for her exceptional dedication to service and the mission of Catholic education in the Diocese of Erie. The members of the Gannon University family congratulate and wish God's continued blessings on Sister Naomi Wood, SSJ, '69VMC, for her exceptional dedication to service and the mission of Catholic education in the Diocese of Erie. Ad multos anos, Sister Rita Zattosky, OSB! Thank you for your many years of saying "yes" to all Christ asks of you. The faithful of the Diocese of Erie are blessed by your love. The members of the Gannon University family congratulate and wish God's continued blessings on Sister Rita Zattosky, OSB, '73VMC, for her exceptional dedication to service and the mission of Catholic education in the Diocese of Erie. Since 2014, Sister Mary Ann has served as the local leader of the Sisters of Mercy in Erie. In that capacity, she is responsible for the day-to-day operations of the motherhouse, as well as the daily lives of the sisters. A native of DuBois, she entered her religious community in 1968. She earned a bachelor’s degree in music education from Mercyhurst University, Erie, and a master’s in music education from Duquesne University, Pittsburgh. From 1978-87, she was awarded several advanced certificates from the Pennsylvania Department of Education. She was a teacher and then principal at St. Patrick School, Franklin, and then was administrative assistant for one year at the Mercy Center for Women. From 1996 to 2002, she served as director of teacher personnel for the Diocese of Erie’s Catholic Schools Office. For the next 11 years, she was president of Mercyhurst Preparatory School, Erie. During that time, she was elected to community leadership and served as councilor. Congratulations! Thank you for your service to Mercyhurst Preparatory School. We are blessed to be a sponsored ministry of the Sisters of Mercy. The faculty, staff, students and alumni of DuBois Central Catholic wish God's continued blessings on Sister Mary Ann ('67) for her outstanding service to the mission of Catholic education in the Diocese of Erie. Mercyhurst University congratulates those celebrating jubilee years in 2018! Special thanks to Sister Mary Ann Bader for your contributions to the Mercyhurst community! The members of the Gannon University family congratulate and wish God's continued blessings on Sister Mary Ann Bader, RSM, for her exceptional dedication to service and the mission of Catholic education in the Diocese of Erie. Sister Marla has ministered to both young children and the elderly, working in two different ministries during her life with the Benedictine Sisters of Erie. First, she was an elementary school teacher, and later was an administrative assistant at Benetwood Apartments. For 32 years, she taught at St. Mary, St. Luke and St. Jude schools in Erie, St. Michael School in Fryburg, St. Stephen School in Oil City, and St. Gregory School in North East. Since 1999, she has remained in Erie, working as administrative assistant at Benetwood, an outreach of the Benedictine Sisters of Erie. Benetwood offers monastic hospitality to people who are elderly, those with disabilities, and others who live on a low income. Sister Marla points to the importance of personal and communal prayer, Scripture reading, retreats and the love and support of the community as essential to the growth of her spiritual life. The members of the Gannon University family congratulate and wish God's continued blessings on Sister Marla Bleil, OSB, '69VMC, for her exceptional dedication to service and the mission of Catholic education in the Diocese of Erie. Officially retired since finishing his eight-year pastorate at St. George Parish, Erie, in February 2017, Msgr. Brugger has taken on other responsibilities for the diocese. From June 2017 to January 2018, he was administrator of St. Michael the Archangel Parish, Emlenton. Then, in February 2018, he became administrator of St. Anthony of Padua Parish, Cambridge Springs, a position he held until the end of July. Previously, he was pastor at St. Jude the Apostle Parish, Erie; and St. Catherine of Siena Parish, DuBois. A native of St. Luke Parish, Erie, he was ordained in 1968. He was named parochial vicar of Holy Rosary Parish, Johnsonburg, and St. Francis of Assisi Parish, Clearfield. While in Clearfield, he was on the faculty of St. Francis High School, from 1968-71. From 1971-81, he was parochial vicar at St. Peter Cathedral Erie, and later served in the same position at Holy Rosary, Erie. He has held various diocesan posts, including president of the Priests’ Senate, dean of the DuBois area, episcopal vicar of the Western Vicariate, director of clergy personnel and a member of the Priests’ Personnel Board and Presbyteral Council. Congratulations from your real home parish, St. John the Baptist, and gratefulness from the parish you served, Holy Rosary, Erie. Congratulations on your 50th anniversary of ordination and thank you for your pastoral care of the people of St. Anthony of Padua and St. Bernadette Mission during a difficult time. Congratulations on your jubilee. Thank you from St. George Parish. The members of the Gannon University family congratulate and wish God's continued blessings on Msgr. Robert Brugger, for his exceptional dedication to service and the mission of Catholic education in the Diocese of Erie. Father Chaplin retired from active priesthood in 2011, but for two years—from 2015-17—he served as sacramental assistant at St. Bernard Parish in Falls Creek. A native of Clearfield, he earned a bachelor’s degree in philosophy from the University of Notre Dame, and a master’s in theology from the Universidad Catolica (Catholic University) of Santiago, Chile. Ordained a priest of the Congregation of Holy Cross, he ministered in education as a teacher and counselor in Escuela San Francisco in Santiago, and assisted in parishes and schools in Oregon for several years. Upon returning to the Diocese of Erie in 1996, he served as a chaplain at the State Correctional Institution-Houtzdale, with a weekend assignment at St. Francis of Assisi Parish, Clearfield, and residence at Holy Trinity in Ramey. In 2003, he was incardinated into the Diocese of Erie. For a short period, he was administrator of St. Basil the Great Parish, Coalport. From 2008-09, he was sacramental assistant at Christ the King Manor in DuBois, the DuBois Medical Center, Holy Cross Parish in Brandy Camp, and Christ the King Parish in Houtzdale. For two years before retiring, he was a senior associate at St. Francis of Assisi. Congratulations! Thanks for all you do for us at Christ the King Manor. Thank you Father John Chaplin, for your service to the people of the Diocese of Erie. May God continue to bless you in your ministry as a priest. We offer prayers for you as you celebrate your jubilee. The members of the Gannon University family congratulate and wish God's continued blessings on Father John Chaplin for his exceptional dedication to service and the mission of Catholic education in the Diocese of Erie. Sister Nancy currently serves as director of the Office for Religious and the Office for Small Communities and Lay Ministry Training and RCIA in the Diocese of Erie. A native of St. John the Baptist Parish, Erie, she entered the Sisters of St. Joseph in 1968. Previously, she was a school social worker and family minister at Sacred Heart Parish, Erie. A graduate of Villa Maria Academy, she earned a bachelor’s degree in elementary education from Villa Maria College. She also earned a bachelor’s in social work from Villa Maria College, and a master’s in pastoral ministry from LaSalle University, Philadelphia. Her earlier ministries included serving as director of RENEW for the diocese, and teaching at several Catholic elementary schools in Erie. For two years, she was a home school visitor for the Northwest Tri-County Intermediate Unit. Sister Nancy was honored as a Serra Club “Woman Religious of the Year.” She serves on the boards of the North American Forum for Small Christian Communities and the National Alliance of Parishes Restructuring into Small Communities. Hearty congratulations from your home parish, St. John the Baptist! You make us proud! The members of the Gannon University family congratulate and wish God's continued blessings on Sister Nancy Fischer, SSJ, '72VMC, for her exceptional dedication to service and the mission of Catholic education in the Diocese of Erie. Sister Susan grew up in South Bend, Ind., where she began her religious life with the Daughters of Divine Charity. After much discernment, she transferred her religious vows to the Benedictine Sisters of Erie in 1988, and has always trusted that her ministry is in the hands of God. Including her time ministering in dioceses located in New Jersey and New York, she spent 26 years working in elementary education. After various teaching assignments in the Diocese of Erie, she held the position of parish office manager at St. James Parish, Wesleyville. Sister Susan then spent nearly a decade working in a variety of positions with Benet Press, the Alliance for International Monasticism and Benetvision. Since 2013, she has served in the community’s development office and has taught at the Inner-City Neighborhood Art House. The members of the Gannon University family congratulate and wish God's continued blessings on Sister Susan Freitag, OSB, for her exceptional dedication to service and the mission of Catholic education in the Diocese of Erie. Sister Janet grew up in North East, and attended her parish school, St. Gregory. When she entered the Benedictine community in Erie, she began her ministry as an elementary school teacher at Immaculate Conception School in Clarion and Sacred Heart School in Sharon. Eventually, she returned to school to become a registered nurse. She spent 22 years ministering in the medical community as a nurse, a nurse practitioner, and a nursing instructor. Her efforts in that position have led to countless young women and men being prepared as compassionate, caring and well-trained nurses. Sister Janet says she is inspired daily by praying the Liturgy of the Hours and by observing members of her religious community care for each other in small ways. Today, Sister Janet works as an assistant to the community archivist at Mount St. Benedict Monastery. Congratulations, Sister Janet Goetz, OSB, on your 50th jubilee. You have been a blessing to the Diocese of Erie and we offer prayers of deep gratitude for your service. The members of the Gannon University family congratulate and wish God's continued blessings on Sister Janet Goetz, OSB, '77VMC, for her exceptional dedication to service and the mission of Catholic education in the Diocese of Erie. Sister Mary Susan is the health insurance coordinator for the Benedictine Sisters of Erie, a position she has held for the past 28 years. A native of Pittsburgh, she worked for several years after high school before entering the Benedictine Sisters of Benet Lake, Wisc. She spent 17 years as a member of that community. While there, she served as procurator and formation director. In 1986, she came to Erie when her community of origin began a merger process with the Benedictine Sisters of Erie. In 1991, she transferred her vows and was fully incorporated as an Erie Benedictine. Her community notes that Sister Mary Susan’s gentle and generous presence in her ministry and her community is based in her deep commitment to Christ. The members of the Gannon University family congratulate and wish God's continued blessings on Sister Susan Hallstein, OSB, for her exceptional dedication to service and the mission of Catholic education in the Diocese of Erie. Father Murphy currently is senior associate at St. Luke Parish, Erie. He spent most of his priestly life in the Archdiocese of Denver, but maintained strong connections to the Diocese of Erie, having been born here in 1942, and having attended St. Joseph School, Erie, from 1948-50. He returned to Erie in 2007 to serve as pastor of St. Gabriel Parish, Port Allegany, and its mission church of St. Mary in Roulette. He served a three-year term on the Liturgical Commission of the diocese. From 2009-10, he was pastor of St. Theresa Parish, Shinglehouse, and St. Mary Parish, Eldred. For a year, he was administrator of Mount Calvary Parish, Erie, when he assumed his role as chaplain at Hamot Hospital. He remained at Hamot for seven years, retiring in 2017. The members of the Gannon University family congratulate and wish God's continued blessings on Father John Murphy for his exceptional dedication to service and the mission of Catholic education in the Diocese of Erie. For more than half of his priesthood, Msgr. Gerald Ritchie has served as pastor of Our Lady of Mercy Parish in Harborcreek. He was assigned pastor there in 1990. A native of Erie, Msgr. Ritchie’s home parish is Blessed Sacrament. Following his ordination in 1968, he was named parochial vicar at St. Catherine of Siena Parish, DuBois, from where he also served in campus ministry at the DuBois campus of Penn State. He then joined team ministry, as parochial vicar, at Sacred Heart Parish in Erie. From 1981-85, he served as pastor of St. John Parish, Tidioute, and St. Anthony Parish, Tionesta. For the next five years, he was pastor of St. Francis of Assisi Parish in Clearfield. From 1989-94, Msgr. Ritchie served on the Presbyteral Council. Thank you, Msgr. Gerald Ritchie, for your service to the people of the Diocese of Erie. May God continue to bless you in your ministry as a priest. We offer prayers for you as you celebrate your jubilee. The members of the Gannon University family congratulate and wish God's continued blessings on Msgr. Gerald Ritchie for his exceptional dedication to service and the mission of Catholic education in the Diocese of Erie. Although he is retired, Father Simmons remains a chaplain to the Sisters of St. Joseph Motherhouse, Erie. He has spent a great deal of his priesthood as a spiritual counselor. In 1989, he joined the staff of the Ecclesia Center, a residential facility designed to provide rest and renewal to church ministers. He still does Ecclesia ministry from his office at Blessed Sacrament Parish, Erie, with residence at nearby Sacred Heart Parish. Previously, he served as administrator and then pastor of St. Matthew-in-the-Woods Parish, now All Saints Parish, Waterford. For 10 years, from 1975-85, he was in campus ministry at the former Villa Maria College, Erie. Following his ordination 50 years ago, he was named parochial vicar at St. Jude the Apostle Parish, Erie. He was also parochial vicar in team ministry at Ss. Cosmas and Damian Parish, Punxsutawney. The parish family of Ss. Cosmas & Damian Parish in Punxsutawney wishes to offer its congratulations and many thanks for your 50 years of faithful service. May God continue to bless you abundantly! The faithful of the Diocese of Erie are grateful for all you have done for them in your ministry and pastoral care. We pray that God will give you peace, strength and great joy as you continue to serve. The members of the Gannon University family congratulate and wish God's continued blessings on Father Jerome Simmons, '63U, for his exceptional dedication to service and the mission of Catholic education in the Diocese of Erie. Sister Dorothy Stoner, OSB, you have given us a wonderful example of Colossians 3:17, doing "everything in the name of the Lord Jesus, giving thanks to God the Father through him." Happy 50th jubilee! The members of the Gannon University family congratulate and wish God's continued blessings on Sister Dorothy Stoner, OSB, for her exceptional dedication to service and the mission of Catholic education in the Diocese of Erie. Msgr. Urbaniak has spent 29 years of his priesthood ministering to the people of St. Stanislaus Parish in Erie. In 1989, he was first named administrator of St. Stanislaus, where he was born and raised. He became pastor in 1990, and remains in that position today. In 2017, he took on the pastorate of nearby Holy Trinity, a partnered parish with St. Stanislaus. His most recent diocesan post was as dean of the Erie East Deanery, a position he held from 2009-10. For 15 years, from 1974-89, he was administrator of St. Bernard Parish, Falls Creek. Ordained in 1968, he started teaching at Cathedral Prep, but then joined the faculty at DuBois Central Catholic, DuBois, where he remained until 1988. In addition to teaching at DCC, he also served for a period there as assistant headmaster. Congratulations on your 50-year anniversary from your former parish, St. Bernard Church, Falls Creek. With gratitude, DuBois Central Catholic recognizes the many years of teaching and guidance offered to our students, families, faculty and staff by Msgr. Urbaniak. The members of the Gannon University family congratulate and wish God's continued blessings on Msgr. Bernard Urbaniak, '76G, for his exceptional dedication to service and the mission of Catholic education in the Diocese of Erie. Father Wozniak has dedicated his priestly ministry to education, the past 43 years spent at Gannon University in Erie. Immediately after his ordination in 1968, he began teaching at Cathedral Preparatory School, Erie, until, in 1975, he was appointed to Gannon’s faculty. Today, he continues to hold the position of assistant professor of theology. For many years, he was assistant professor of pastoral studies. He served as chair of Gannon’s Department of Theology for seven years. In 1993, he earned a doctorate in systematic and historical theology at Duquesne University in Pittsburgh. Besides his years in education, he served for five years as co-chaplain for the Sisters of the Divine Spirit, while they served in the Diocese of Erie. From 2009-14, he was the censor librorum for the diocese. According to ecclesiastical law, the censor librorum is appointed by the bishop to examine before publication those writings or other communications that are subject to the church’s supervision. He continues to serve as weekend sacramental assistant at Our Lady of Mount Carmel Parish, Erie. Thank you for many years of devoted service to Our Lady of Mount Carmel Parish and congratulations on your golden jubilee to the priesthood. And "don't worry!" Thank you, Father Casimir Wozniak, for your service to the people of the Diocese of Erie. May God continue to bless you in your ministry as a priest. We offer prayers for you as you celebrate your jubilee. The members of the Gannon University family congratulate and wish God's continued blessings on Father Casimir Wozniak, '74G, for his exceptional dedication to service and the mission of Catholic education in the Diocese of Erie. In his 40 years as a priest, Father Brooks has served as the pastor or co-pastor of five parishes in the Diocese of Erie, including Blessed Sacrament, Sacred Heart, Our Lady of Peace and St. Jude the Apostle parishes, all in Erie; and St. Gregory Parish, North East. He currently is pastor of St. Gregory, a position he has held the past seven years. After his ordination in 1978, Father Brooks taught for six years at Venango Catholic High School in Oil City, and was weekend assistant at St. Michael Parish, Fryburg, and resident priest at St. Joseph Parish, Oil City. He also served as weekend assistant at St. John Parish in Tidioute, and administrator of Our Lady, Help of Christians, Oil City. His diocesan posts have included diocesan scout chaplain, and board member of the Presbyteral Council and the Bishop’s College of Consultors. Congratulations on 40 years of faithful service as a priest from your home parish, St. John the Evangelist in Girard. Parishioners and staff of St. Gregory Thaumaturgus Parish, North East, PA, warmly congratulate Father Thomas Brooks for his dedicated 40 years of service. God bless! The members of the Gannon University family congratulate and wish God's continued blessings on Father Thomas Brooks, '74U, for his exceptional dedication to service and the mission of Catholic education in the Diocese of Erie. Father Brown is pastor of St. Raphael Parish in Eldred, and its secondary mission churches of St. Mary in Eldred, and St. Theresa in Shinglehouse. He has been the spiritual leader of all three communities since 2011. Ordained in 1978, Father Brown is a native of St. Luke Parish, Erie. His first assignment as parochial vicar was at St. Michael Parish, Greenville, where he served in campus ministry at nearby Thiel College. In 1982, he was named chaplain at Hamot Hospital, Erie, and was co-pastor of St. Patrick Parish for a little more than a year. Named chaplain of the Legion of Mary, he then served as parochial vicar at St. Jude the Apostle and Holy Rosary parishes, both in Erie. In 1988, he became pastor of St. Bibiana Parish, Galeton, a position he held for 12 years. He served as scout chaplain for the diocese, and was appointed to a five-year term on Presbyteral Council. From 1997 to 2000, he was administrator of Sacred Heart Parish, Genesee, and then was pastor the next 11 years of St. Elizabeth Parish, Corry. He also served a term as dean of the Warren Deanery. Thank you, Father Tom, for your wonderful service to Holy Rosary, Erie! The members of the Gannon University family congratulate and wish God's continued blessings on Father Thomas Brown, '74U, for his exceptional dedication to service and the mission of Catholic education in the Diocese of Erie. For the past 19 years, Father Suppa has been pastor of St. Teresa Parish in Union City, and administrator of its secondary mission church of Our Lady of Fatima, also in Union City. He has served at various times on the bishop’s Pastors’ Review Board and Prebyteral Council. Previously, he was pastor of St. Venantius Parish, Rouseville; Assumption of the Blessed Virgin Mary, Oil City; and St. Agnes, Morrisdale. From 1990-95, he was regional director of ecumenical affairs for the Eastern Vicariate. While in Oil City, he was liaison to renewal programs and chaplain to Venango County charismatics. Following his ordination in 1978, he was named parochial vicar at St. Catherine of Siena Parish, DuBois, and then became administrator of St. Joseph Parish, DuBois. He also served as parochial vicar at St. Leo Magnus Parish, Ridgway. The members of the Gannon University family congratulate and wish God's continued blessings on Father F. Thomas Suppa, '74U, for his exceptional dedication to service and the mission of Catholic education in the Diocese of Erie. Father Walk is currently serving as administrator of St. Bernard Parish, Falls Creek. Previously, he was a priest in residence at St. Michael the Archangel Parish in DuBois, having taught at DuBois Central Catholic High School from 1992 to 2018. He was headmaster of DuBois Catholic from 1992-97. Since his ordination, he also taught at Elk County Catholic in Saint Marys, and at Kennedy Catholic High School in Hermitage. While he performed his education ministry, he was a weekend assistant at the following parishes: St. Boniface, Kersey; Church of the Good Shepherd, West Middlesex; St. Joseph, Sharon; St. Ann and Immaculate Conception, both in the Brookville area; and St. Francis of Assisi in Clearfield. Congratulations from your parish. St. Bernard Church, Falls Creek, on your 40-year anniversary. Blessed by your teaching and preaching for 26 years, the faculty, staff, students and families of DuBois Central Catholic express sincere thanks for your years of unwavering support of all things Central! The members of the Gannon University Family congratulate and wish God's continued blessings on Father Edward Walk, '74U, for his exceptional dedication to service and the mission of Catholic education in the Diocese of Erie. A monk of Saint Vincent Archabbey in Latrobe, Father Buccicone has spent all of his priestly life in parishes, including Sacred Heart in Saint Marys in the Diocese of Erie, where he served as parochial vicar from 1993 to 2002. For the past 16 years, he served as pastor of Queen of Peace Parish, Patton, in the Diocese of Altoona-Johnstown. A graduate of Saint Vincent College and Saint Vincent Seminary, he was trained as a graphic designer, illustrator and iconographer. Father Buccicone is best known for his baking and culinary artistry, overseeing the parish bakery and catering services in Patton, and acquiring the nickname “The bread priest.” Having renovated and restored both churches to which he was assigned, he also designed the choir chapel of the Priory in St. Marys. He has been called to a new ministry, that of assisting pastors and their parishes in the pursuit of beauty. Father Ananias Buccicone, OSB, congratulations on your 25th jubilee. The Diocese of Erie has been richly blessed by the Benedictine charisms and generous pastoral care you have shared with the faithful. God bless you! The members of the Gannon University family congratulate and wish God's continued blessings on Father Ananias Buccicone, OSB, for his exceptional dedication to service and the mission of Catholic education in the Diocese of Erie. Since 2012, Father Malthaner has served as pastor of St. Luke Parish, Erie, and as dean of the Erie East Deanery. Currently, he also serves on the Presbyteral Council. In the last few years, he has taken on extra temporary roles as administrator of St. Boniface Parish, Our Lady of Mount Carmel and Our Lady of Mercy parishes, all in Erie. Since his ordination in 1993, Father Malthaner was parochial vicar at St. Joseph/Bread of Life, and St. George parishes, both in Erie. He was administrator at St. George and at Our Lady, Help of Christians Parish, Oil City. From 1999 to 2012, Father Malthaner was on the faculty and served as headmaster of Venango Catholic High School in Oil City. He completed two separate terms on the Priests’ Personnel Board, and served his first term on the Presbyteral Council from 2004-09. Another diocesan post included two, four-year terms with Clergy Continuing Education. The members of the Gannon University family congratulate and wish God's continued blessings on Father John Malthaner, '91U, for his exceptional dedication to service and the mission of Catholic education in the Diocese of Erie. Father Priscaro currently is resident priest at Erie’s St. Ann Parish, where he was raised. He’s also the Catholic chaplain to many nursing care residences and the Pennsylvania Soldiers’ & Sailors’ Home in Erie. In the spring of 2018, he was named chaplain of the World Apostolate of Fatima (Blue Army) in the Diocese of Erie. Father Priscaro has dutifully served in various parishes throughout the diocese. After his ordination in 1993, he was assigned as parochial vicar at Good Shepherd Parish, West Middlesex, and then in the same capacity at St. Joseph Parish, Sharon. For two years, he was a full-time faculty member at Kennedy Catholic High School in Hermitage. Father Priscaro also was parochial vicar at St. Brigid Parish, Meadville, and at St. Boniface Parish, Erie. He was resident priest at St. Paul Parish, Erie, and from 2006-07, was administrator of St. Gabriel Parish in Port Allegany. The members of the Gannon University family congratulate and wish God's continued blessings on Father Jerry Priscaro, '88U, for his exceptional dedication to service and the mission of Catholic education in the Diocese of Erie. A current faculty member and director of human formation at Saint Vincent Seminary in Latrobe, Father Tompkins is a Benedictine monk of Saint Vincent Archabbey. During his 25-year priesthood, he also served as dean of students, vice rector and director of field education at the seminary. Father Tompkins served as a parochial vicar at parishes in Pittsburgh, Latrobe and in Virginia. At one time, he was pastor of Queen of the World Parish in Saint Marys in the Diocese of Erie. A native of Troy, N.Y., he graduated from the U.S. Military Academy at West Point. He served as a military police officer from 1982 until his entrance into the monastery in 1987. After earning his master’s in systematic theology in May 1993, he was ordained a priest by Greensburg Bishop Anthony Bosco. Congratulations and God's blessings, Father John-Mary, from Queen of the World! Father John-Mary Tompkins, OSB, congratulations on your 25th jubilee. The Diocese of Erie has been richly blessed by the Benedictine charisms and generous pastoral care you have shared with the faithful. God bless you! The members of the Gannon University family congratulate and wish God's continued blessings on Father John-Mary Tompkins, OSB, for his exceptional dedication to service and the mission of Catholic education in the Diocese of Erie. The following deacons are celebrating the 10th anniversary of their ordinations to the permanent diaconate in the Diocese of Erie. All were ordained May 16, 2008, at St. Peter Cathedral in Erie. Deacon Lawrence Caggeso, the Diocese of Erie is deeply grateful for the selfless service you have offered through your ministry and through your parish. May God bless you and your family. The members of the Gannon University family congratulate and wish God's continued blessings on Deacon Lawrence M. Caggeso for his exceptional dedication to service and the mission of Catholic education in the Diocese of Erie. Your leadership, preaching and presence here at St. John the Baptist are examples of the gifts you share. Thank you and congratulations, Deacon Denis! Called to be "as servant in a servant-church," Deacon Denis Coan, you have responded with generosity. The Diocese of Erie thanks you for your wonderful example. The members of the Gannon University family congratulate and wish God's continued blessings on Deacon Denis Coan for his exceptional dedication to service and the mission of Catholic education in the Diocese of Erie. For your proclamation, your witness and service, Deacon Raymond Ehrensberger, the Diocese of Erie recognizes your willingness to say "yes." Congratulations on your jubilee! The members of the Gannon University family congratulate and wish God's continued blessings on Deacon Raymond Ehrensberger for his exceptional dedication to service and the mission of Catholic education in the Diocese of Erie. Thank you, Deacon Francis Lombardo, for the great gifts you have given to the faithful. Your generosity is very much appreciated by the faithful and by the Diocese of Erie. The members of the Gannon University family congratulate and wish God's continued blessings on Deacon Francis Lombardo for his exceptional dedication to service and the mission of Catholic education in the Diocese of Erie. For 10 years of generous service, Deacon John Mang, the Diocese of Erie has been richly blessed by your selflessness and pastoral care. May God bless you as you celebrate your jubilee. The members of the Gannon University family congratulate and wish God's continued blessings on Deacon John Mang for his exceptional dedication to service and the mission of Catholic education in the Diocese of Erie. Currently retired after years of service as a permanent deacon at Holy Trinity Parish, Erie. Deacon Thomas Matusiak, the Diocese of Erie is deeply grateful for the selfless service you have offered through your ministry and through your parish. May God bless you and your family. The members of the Gannon University family congratulate and wish God's continued blessings on Deacon Thomas Matusiak, '66U, for his exceptional dedication to service and the mission of Catholic education in the Diocese of Erie. Called to be "as servant in a servant-church," Deacon Kenneth Reisenweber, you have responded with generosity. The Diocese of Erie thanks you for your wonderful example. The members of the Gannon University family congratulate and wish God's continued blessings on Deacon Kenneth Reisenweber, '74U, for his exceptional dedication to service and the mission of Catholic education in the Diocese of Erie. For proclaiming witnessing and serving, Deacon Owen Wagner, the Diocese of Erie recognizes your willingness to say "yes." Congratulations on your jubilee! The members of the Gannon University family congratulate and wish God's continued blessings on Deacon Owen Wagner for his exceptional dedication to service and the mission of Catholic education in the Diocese of Erie. Thank you, Deacon J. Timothy Wren, for the great gifts you have given to the faithful. Your generosity is very much appreciated by the faithful and by the Diocese of Erie. The members of the Gannon University family congratulate and wish God's continued blessings on Deacon J. Timothy Wren for his exceptional dedication to service and the mission of Catholic education in the Diocese of Erie. Ordained June 8 at St. Peter Cathedral in Erie, Father Boyd now serves as parochial vicar of St. Agatha, St. Brigid and St. Mary of Grace parishes, all in Meadville. A native of Erie, he was raised at Our Lady of Mount Carmel Parish, but then moved with his family to St. James Parish. He graduated from Our Lady of Mount Carmel School and Cathedral Preparatory School, both in Erie. He entered St. Mark Seminary and studied at Gannon University, Erie, where he earned his bachelor’s degree in philosophy in 2014. In May 2018, he earned his master of divinity degree from Saint Vincent Seminary in Latrobe. He received the Diakonia Award for exhibiting praiseworthy academic performance and service to the seminary community through building student morale and spirit, exercising leadership within the community and demonstrating creative outreach to others. Congratulations on your ordination to the holy priesthood from your parish family of Ss. Cosmas & Damian in Punxsutawney. May God bless you as you continue on your spiritual journey! Congratulations on your ordination the priesthood. We are proud to have an alumnus of Our Lady of Mount Carmel School serving the Lord and his church as a priest. Ad Multos Annos! The members of the Gannon University Family congratulate and wish God's continued blessings on Rev. Andrew Boyd, '14U, for his exceptional dedication to service and the mission of Catholic education in the Diocese of Erie. A native of St. Joseph Parish in Sharon, Father McElrath was ordained June 8 at St. Peter Cathedral in Erie. He currently is parochial vicar at St. Joseph and St. Stephen parishes, both in Oil City. He is a graduate of St. Joseph School, Sharon, and Kennedy Catholic High School in Hermitage. In 2010, he entered St. Mark Seminary, Erie, while attending Gannon University. He graduated from Gannon in 2014, having earned a bachelor’s degree in philosophy. He continued his priestly formation at St. Mary’s Seminary and University, Baltimore, Md., graduating in May 2018 with a master’s in divinity and a bachelor’s in sacred theology. During his transitional diaconate year, he served at St. Joseph Parish in Warren. The members of the Gannon University family congratulate and wish God's continued blessings on Rev. Ian McElrath, '14U, for his exceptional dedication to service and the mission of Catholic education in the Diocese of Erie.